Many of of thought it was surprising when National Development withdraw their application for extended last call hours at MarketStreet and didn’t even ask for New Years Eve. Well, they came back this past Monday requesting a closing time of 1:00 AM for severael of the restaurants and the Selectmen approved their request. Not all all restaurants will be open so it would be wise to check with the establishment you are thinking about going to. Jane Tremblay, principal at the Summer St school, has been selected to be the new supt. Gone by the end of the year. 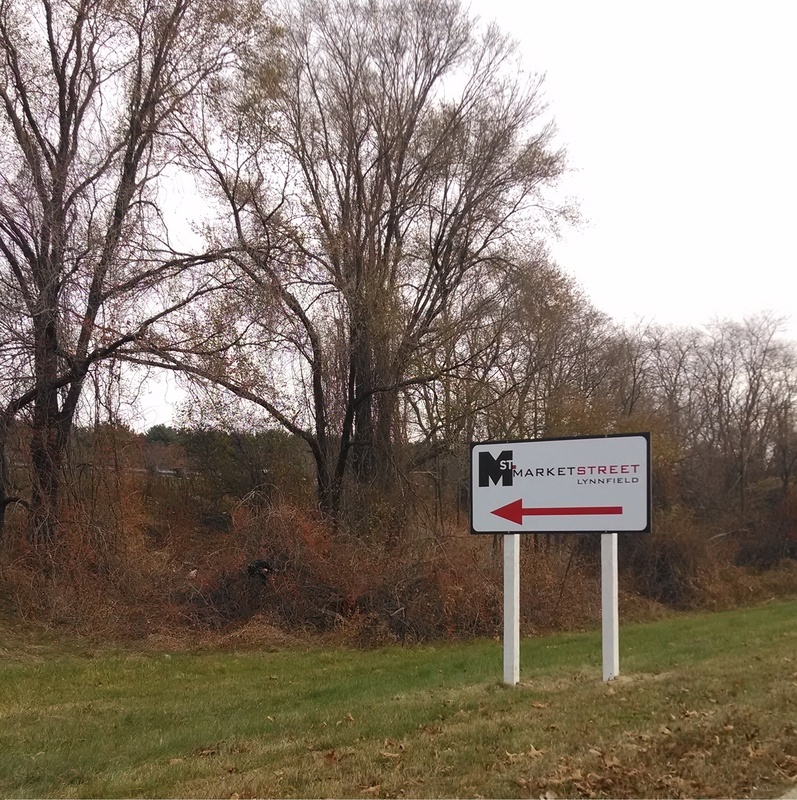 Hi Wally – we met with local officials about a month ago and they raised concerns with people exiting I-95 North destined to the development that were mistakenly turning right and ending up turning around on some of the residential side streets near Salem Street. In an effort to assist the community, we authorized the temporary placement of the sign. It will be removed at the end of the year. 1. how did it get there? 2. will more signs be added? We will attempt to find out. This is on state land so we have started there. Stay tuned. This may have been a record high week for Lynnfield in the Globe the past 10 days. With the football, soccer and volleyball teams all in the playoffs it was a busy week in the Sports pages. In the North Section today there is an article about Lynnfield being dining destination. Article is attached. From the Lynnfield Business Coalition that sponsor Shadowing Day for High School Juniors, Candidates Night and an annual scholarship. These make great holiday gifts and benefit a great organization in town and I am a member. Up to $400,000 Massachusetts PARC grants are available to cities and towns that are improving or creating athletic fields for their communities. Therefore, many cities and towns have turf fields that are dedicated and deeded for park and recreation purposes only. To qualify for these grants, land must be dedicated to park and recreation purposes and not under the care and control of the School Committee. The request by National Development to extend the "last call for alcohol" at MarketStreet was withdrawn and they agreed to a request by Joe DeMaina to remove ambiguity about proposed uses. A good night for Lynnfield. Thank you for all who attended and or wrote emails or called the Selectmen.